When I try to play a DVD (region 1, and unregioned), it gives a gstreamer backend error about not being able to read the title, but seemingly has already found the title as it is in the playlist correctly. I have noticed this same issue on Xubuntu 12.10 and Xubuntu 13.04, parole auto-loads the disc and then I get a gstreamer backend error cannot load title. Not sure if this matters, but on both of the systems I am using, I have installed VLC and it will successfully play DVDs. This bug has been reported on the Ubuntu Package testing tracker. I'm getting this bug in xubuntu 13.10 eveb after installing libdvdcss2. I guess this might only be temporary though (i.e. until I reboot). It's worth noting that VLC played the DVD fine without the symlink. Bug is alive at Xubuntu 13.10 i386 fresh install. This adds a /dev/dvd link to /dev/sr0 each time I reboot partially fixes the problem but does not fix the bug that everyone else will run into. Can confirm this bug in xubuntu 14.04.
ln -s /dev/sr0 /dev/dvd fixes it for the moment. This seems to affect other media players as well. applies to gnome mplayer at Lubuntu 14.04.
screen shot with error message. btw, instructions from https://help.ubuntu.com/community/RestrictedFormats/PlayingDVDs were followed and libdvdread4 is installed properly. just installed VLC and i do not know why, but VLC plays the DVD correctly. gnome mplayer not playing dvd yet. 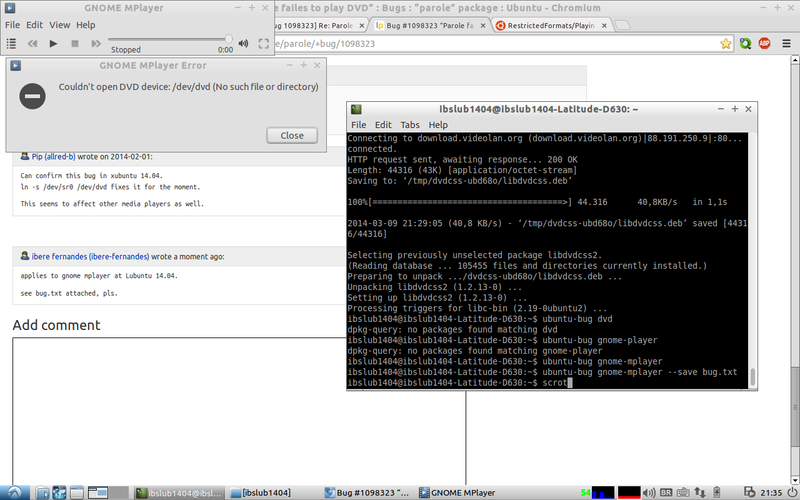 workaround from comment #11 is working to make gnome mplayer play dvds correctly. DVDRead could not open the disc "/dev/dvd1". VLC is unable to open the MRL 'dvd:///dev/dvd1'. Check the log for details. Parole detects the DVD location ( /dev/sr0 seems to be a popular one ), and uses the the dvd uri... dvd:///dev/sr0 to function correctly. Using Ubuntu Trusty and Parole 0.6.1-0ubuntu3 installed, everytime I insert a DVD gstreamer says it Could not read from resource. The 'Insert disc' menu entry is also greyed out but I can manualy open dvd:///dev/sr0 and play DVD's with no issues.